Let's talk about Taral V today. That's the Roman numeral for five by the way, so please don't call it "Taral Vee". 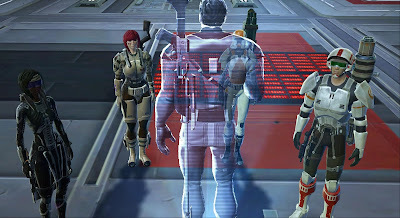 Taral V is the first flashpoint in the mid-level Revan storyline. The arc consists of four flashpoints in total, two of which take place on Republic side and two on Empire side. (I've written about the first one on Empire side, Boarding Party, before.) I think this storyline shows that Bioware was counting very heavily on people playing alts right from the beginning, as you have to play both factions to experience the story in its entirety. Taral V was originally designed for levels 31-37, though it is now accessible from level 15 onwards. It had a hardmode version from launch and received a solo mode in 4.0. Things start with the story quest The Jedi Prisoner, in which a Jedi Master called Oteg who also happens to be a fleet admiral recruits you for a top secret mission. 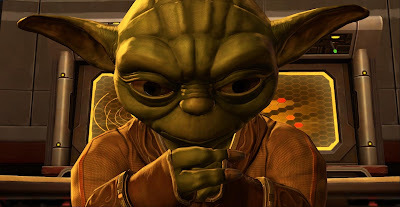 You meet him on the Telos and he's quite a charming chap, of the same species as Yoda from the original trilogy, just quite a bit younger and actually capable of using proper grammar. He reveals to you that the Force ghost of a human woman has been appearing to him, and even enables you to briefly see her for yourself (even if you're not a Force user). She spouts cryptic messages about impending doom and gloom, and Oteg explains that she told him of a Jedi prisoner that is being kept in an Imperial prison in the so-called Maelstrom Nebula. It's absolutely vital to the Republic that he's freed, but the Maelstrom Nebula can't be navigated via ordinary means. To actually find the prison, you'll need to steal a Gree computer from an Imperial base on the planet Taral V. You'll have to infiltrate it with a small strike team by landing in an Imperial shuttle. Got all that so far? 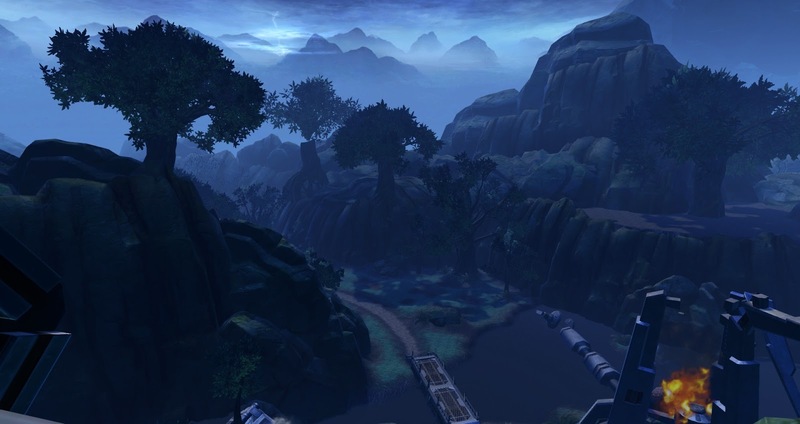 Taral V is a rainy jungle planet very similar to Dromund Kaas and is populated not just by Imperial soliders and scientists, but also by a bunch of hostile wildlife, mostly reptiles of some sort. Oteg says that the Imperials are fond of them, but there's also a small scripted scene where a bunch of swamp monsters climb a bridge with Imperial soldiers on it and they start fighting each other. In general, the trash seems to have been designed in a way that prioritises style over substance, as there are lots of occasions where mobs come running out of tunnels or fly in from above, but most mob groups are so weak that they barely provide more than a speed bump. The bosses are for the most part not terribly interesting, with some very basic mechanics. There's the guy with the two animal adds, the guy with the single animal add (which should die at roughly the same time as him) and the guy who spawns multiple waves of weak animal adds. The bonus boss is the first real challenge, a Sith who has the ability to pull everyone on top of him and then casts a heavy-hitting Force storm that also slows you. 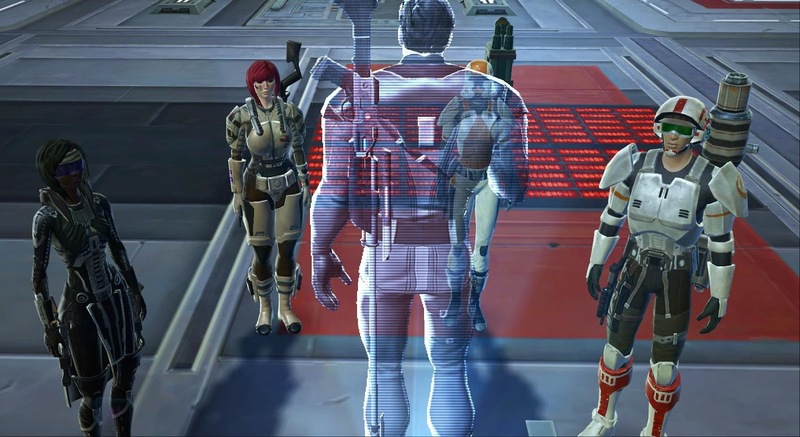 I remember him being one of the first real challenges we faced while levelling up, as it was almost impossible to survive the Force storm if the whole party got caught in one. It turned out that the best strategy was for anyone with range to stand near the door and learn to predict when the boss would do the pull so you could break line of sight just in time to not be affected. That's some pretty advanced stuff for someone still levelling their first character. The droid just before the final building is a fairly straightforward tank and spank, however when doing a tactical run recently I found his damage output to be somewhat overtuned, with unavoidable instant attacks hitting for 20k a pop, which is nearly half of a bolstered levelling character's health bar. My pug of four damage dealers eventually fell apart because even though people made an effort to click the kolto stations, we simply ran out of kolto too quickly and were unable to keep up with the droid's damage. To finish, me and the only other dps that didn't quit had to whip out a tank and healer companion, and even then the boss still hit pretty hard on the tank. The last boss, General Edikar, is also challenging as he summons adds that are very spread out and casts a dot on a random person that hurts pretty badly. Again, this is a problem on tactical mode, where it's not even guaranteed that anyone will have a cleanse. On a side note, back at level fifty I think that Edikar on hardmode was probably the boss that people were cheesing most regularly to circumvent his mechanics. Anyone else remember how everyone would hide behind a box in the corner so all the adds would arrive in a nice clump for AoEing and his turrets couldn't hit you? In quite a few previous Flashpoint Fridays I've talked about the problem of people skipping trash and this causing conflict between these players and those who want to do the bonus content as well. Taral V is another prime offender here. At level fifty I remember people claiming both that they hated getting this as their random hardmode because it's so long as well as saying that they loved it because so much of it can be skipped. As someone who generally likes to do the bonuses, I have to confess that Taral V probably has the worst bonus mission of all the flashpoints because it's incredibly spaced out. Most bonuses really only require you to follow the intended route through the flashpoint and clear all the trash along the way instead of trying to skip pulls. The objectives in Taral V on the other hand are both so numerous and so spread out that you actually need to clear out several side buildings if you want to do the bonus boss, which is pretty annoying to be honest. I'll admit that I found it pretty exciting the first time though, having to explore what felt like the entire flashpoint just to find all of our bonus objectives. You fight your way from your landing point through the jungle, shut down the Imperial security grid and then invade their base, getting occasional advice from Oteg and hearing the voice of the mysterious Force ghost predict more doom and gloom. Just as you enter the final bunker, you suddenly have Grand Moff Kilran on the holo, whom you previously met on the Esseles. He's pleased to see you again and vows to get you this time, even if it means bombarding the whole facility into oblivion. Oteg advises you to finish up quickly, though he will try to stall the Imperial fleet as much as possible. After defeating General Edikar, you confront an Imperial researcher called Doctor Narem. He gets quite uppity about this Republic "act of aggression". When you ask him about the Gree computer, he complains that you stealing it would result in the deaths of loads of researchers that are scouting the nebula right now and would be lost forever without the device's guidance. You have the option to tell him to send them new coordinates to get them back home before handing over the computer or you can say that, civilians or not, you don't care about Imperials dying. As soon as you have the Gree computer, you make your way out. While levelling up my first character and feeling rather let down by the story-light flashpoints that followed after the Esseles, I considered Taral V a refreshing return to story-heavy group content. It doesn't have many cut scenes, but the storyline it is a part of is a pretty epic one. It's also quite a sprawling instance by SWTOR's standards, with a whole bunch of "optional" buildings that you can ignore if you like. I remember finding it exciting to explore these and to discover hidden treasures like bonus loot chests, though those seemed to get removed quite quickly (I'm not sure why). Nowadays it mostly just feels unnecessarily long, considering how much time you spend doing nothing but fighting unchallenging pulls of jungle beasts and Imperials. Even as someone who usually likes to do all the bonus missions, I find Taral V's to be a bit of a pain to complete so that I wouldn't want to do it every run. Nonetheless I personally have a considerable fondness for this flashpoint. It left a strong impression on me as a new player, and to this day I consider it one of the more atmospheric flashpoints. Meeting Grand Moff Kilran again ties the story nicely to that of the Esseles, and considering how many instances take place on space stations and ships, which tend to make for rather dull environments, infiltrating an Imperial base on a largely untamed jungle planet is a refreshing change of pace. Unfortunately (for me) I don't recall much about the first time I ran Taral V, other than being overlevelled and thus running into the large Chapter 1 story spoiler for the Knight during the first conversation with Oteg on the Telos. It would have been nice if it was modified if you hadn't completed chapter 1 when you ran through the FP. I wish the game told you who the ghost was. I had to go and check online to figure that out. Maybe I would have figured it out if I had read the Revan novel before seeing that conversation. I do recall learning to tank during it with a newer character during 2.x and loving the bridge you cross after the second boss. As either a Shadow or a Guardian you could easily throw the mobs off the side (besides using the exploding barrels). Unfortunately, BioWare modified it in 4.0 so the gold mobs are immune to knockbacks. I also recall, for the longest time the 3rd boss (with the waves of weak adds) had something like 8k health and he would die in the opening rotation from the group. Really made him a non-event. 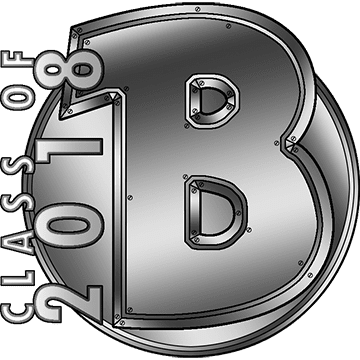 Hm, I don't recall a class story spoiler there, but they definitely do have them in some odd places (I think I previously mentioned the Kaon intro quest having one). And yep, I remember that bug on the third boss! I even tweeted about it at the time. The entrance color is not the usual green, but still it let you pass.